A “very small number” of apprentices could reach the end of their course in the next year without an organisation in place to deliver their final exams, the Institute for Apprenticeships’ boss has admitted. But Sir Gerry Berragan, who gave the opening address at FE Week’s Annual Apprenticeships Conference, promised the IfA was “on the case”. 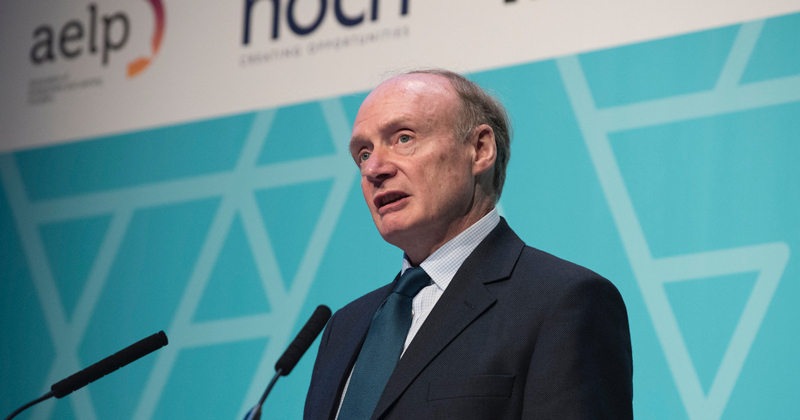 “Of the apprentices that are due to undertake their end-point assessment in the next 12 months, 99.1 per cent are on a standard with at least one end-point assessment organisation in place,” he told the audience. But a “very small number of apprentices” [0.9 per cent of those due to do EPA in the next 12 months] are on eight standards which don’t yet have an assessor organisation in place. “In each case the Education and Skills Funding Agency and the Institute are working with prospective assessment organisations to resolve this,” he said. But Mark Dawe, the boss of the Association of Employment and Learning Providers, later pointed out that simply having an EPA organisation in place wasn’t enough. “We know of many EPA organisations registered but not yet ready to deliver, and the external quality-assurance above them also not ready,” he said during the Q&A session that followed. The issue of apprentices on standards without an EPA organisation in place has been a hot topic for sector leaders, including Sue Pember, director of policy at Holex, who has previously said it’s “disrespectful” for any apprentice to start on a course without anyone to deliver the final exams. But Sir Gerry acknowledged today that there will “always be newly approved longer standards” with no EPA in place. “We know the assessment organisations don’t want to be on the register of end-point assessment organisations too far in advance of EPA taking place because they don’t want to invest in the development of EPA materials several years before they’re used,” he said. He also defended the early days of the apprenticeship reforms, in a speech in which he attempted to bust certain “myths” around apprenticeships. These included plummeting starts over the past year: while admitting that starts are down, he said the fall is now closer to 30 per cent than the 60 per cent that had been feared. In addition, starts on standards are “currently running at 800 per cent up on the previous year” and now represent 40 per cent of all starts. “Despite the headline drop in starts seeming negative when look beneath the headline what you see is a reform programme that’s delivering on its objective,” he said. Sir Gerry outlined the measures the Institute had put in place to speed up the process of standards approval. The IfA now wants 80 per cent of all new standards “to be approved in eight months of first proposal coming forward”, he said. A total of 244 standards were currently ready for delivery. “By the end of this year I predict we will have a total of over 350 standards approved for delivery and that figure will probably rise to around 500 by 2020,” he added. FE Week’s Annual Apprenticeship Conference runs from March 21 to 23 at the International Convention Centre in Birmingham, and features headline speakers including skills minister Anne Milton, and Amanda Spielman, Ofsted’s chief inspector. For live coverage and reaction, follow #FEWeekAAC2018 on Twitter.